Miles to the Finish is the follow up to Miles to Go, published in 2010. Miles to Go begins with the words, "Another day, another drive," as Miles heads off to preschool where he and his friends work on their cars. There are plenty of picture books with cars and trucks and things that go - most of which feature adults in the driver's seats. Miles to the Finish and Miles to Go stand out because it's the kids who are doing all the driving in these books! Miles to the Finish finds Miles back at school, getting ready for the Red Apple School Grand Prix and checking out the competition - a Speedster 660, driven by Indie, a little girl with a purple helmet. Miles and Otto commiserate over how hard it will be to beat an electric car. Once the race starts, the text of Miles to the Finish becomes clipped and as fast paced as the race. There are three-car-pile-ups (and drivers with smiles on their faces) and a quick stop to make sure Otto is o.k. after a spin-out. As Miles puts on the speed, he is neck and neck with Indie - until her motor conks out! Miles has visions of taking the grand prize, but in the end stops so Indie can hop in the back of his car as he races to the finish and nabs second place. The class celebrates and Miles will too, but first he wants to work on the Speedster 660 and get it running again! 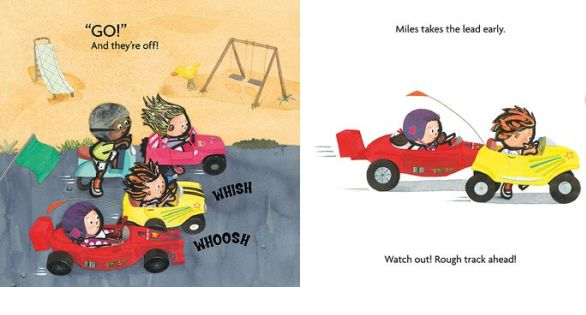 Miles to the Finish is sure to resonate with preschoolers and kindergartners who have learned to take turns with the toy cars that are propelled by their feet, Flintstone-style, and the big, sturdy tricycles as they wait for their turn to ride around the track. Parents will love the camaraderie, empathy and imagination that the kids in Miles to the Finish exhibit.